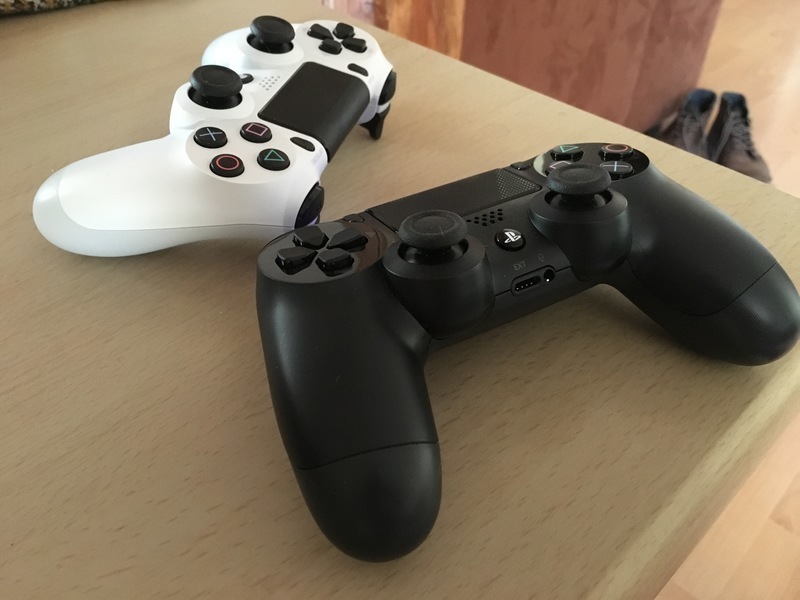 The Playstation 4 came out in 2013 and came with the DualShock 4 controller. I bought one in the midst of a particularly tough hangover, and when I received it two days later the part that most intrigued me was the controller. It's quite an amazing piece of equipment - I originally wanted to claim that the controller alone sported higher specs than the original PSX, and while the CPU is beefier (ARM Cortex M3 @ 160MHz vs MIPS R3K @ 33.8MHz) however the controller has a hundred or so Kb of RAM versus the PSX' 2MB. 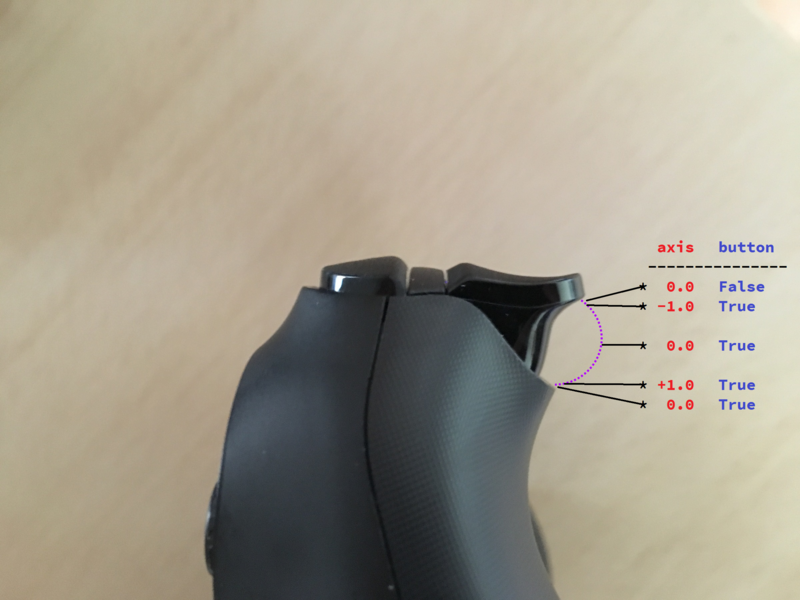 That said the interfaces are pretty cool - in addition to the standard d-pad and X, O, triangle + square buttons there's a couple of analog sticks, shoulder buttons (2 x analogue) and a handful of accelerometers for motion sensing. All in all a nice little controller, no wonder mine needs charged every couple of days. I thought that it'd be nice to play with some of these sensors and write OpenGL code in python. So I put together a quick demo - a 3D cube which is controlled by the accelerometers. It's important to note that we don't necessarily receive updated values each time we call pygame.event.get() - so we need to be careful about how we handle this. There's an ambiguity between the button being halfway and fully pressed. I'm not sure if this is a bug or just a missing feature in pygame. However since I was just using the buttons to control rotation, I was able to carefully select a scaling value (1.0 = 90 degrees) to apply to the value we read so that it's not possible to see this. Computer graphics has a long and storied history of such careful hacks to give the illusion of something working, so I was happy to let this slide! I added a couple more things (shifting the cube around using the touchpad, lighting the cube depending on the buttons pressed) and the results are here this gist if anyone's curious. 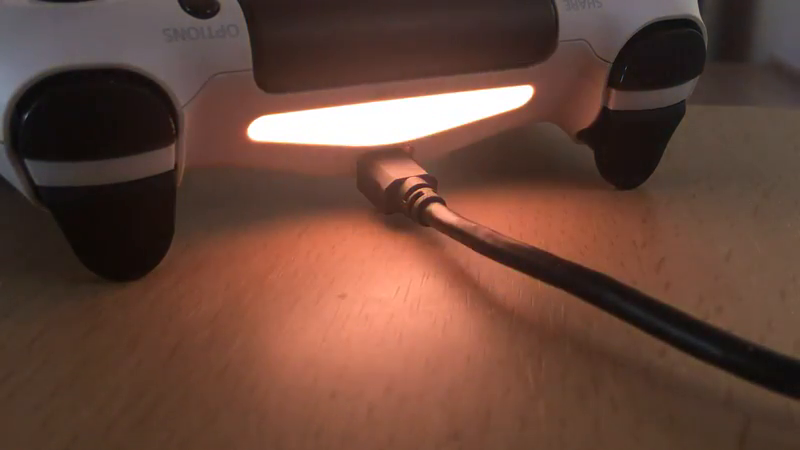 Finally I wanted to use the lightbar - each DualShock 4 has an array of Red, Green and Blue LEDs which can be set independently to 256 different brightness levels. This is put to neat use in things like Grand Theft Auto - when the police are on you the lightbar flashes blue and red. Sadly there doesn't appear to be any way to handle this through the pygame interface, and when I tried dropping to the lower-level evdev interface the leds() method didn't return anything. 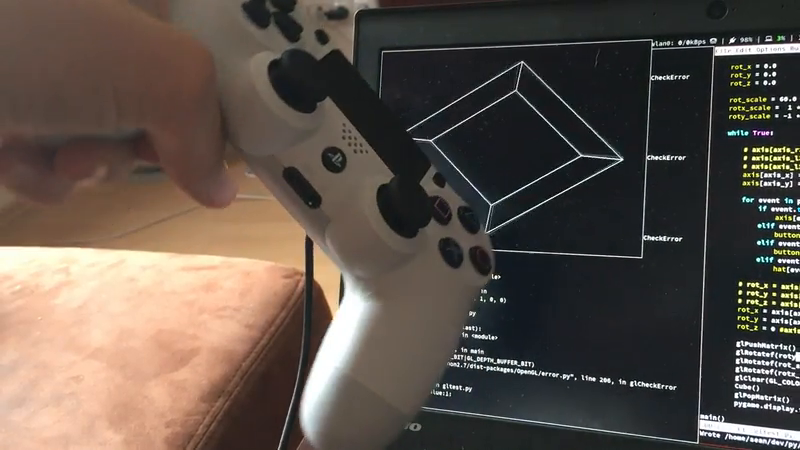 Hey i tested the pygame joystick for my ds4 but i couldnt get the axis values of accelerometers else everything works fine. I got the same issue as Shubhankar Das. The axes and button functions are fine, but I have no access to the accelerometers and/or gyro sensor. Could you give us some hint?